Watch CPAC and follow our live online coverage as Governor General David Johnston opens Canada's 42nd Parliament. 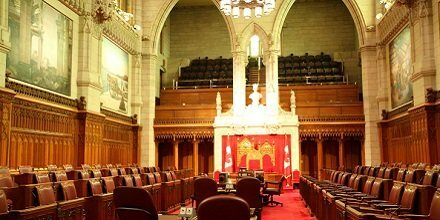 What is the constitutional basis for the Speech from the Throne? 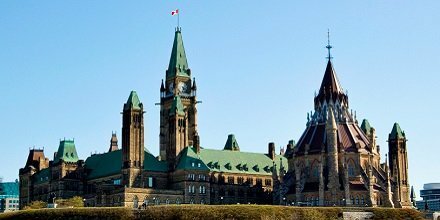 "Section 38 of the Constitution Act, 1867 provides for the summoning of Parliament: 'The Governor General shall from Time to Time, in the Queen’s Name, by Instrument under the Great Seal of Canada, summon and call together the House of Commons'. "The 'Instrument' consists of a series of proclamations issued by the Governor General on the advice of the Prime Minister and published in the Canada Gazette. On the day that Parliament is dissolved or prorogued, a proclamation is issued summoning Parliament to meet on a given day. It is issued at the end of the preceding session, in keeping with the principle of the continuity of Parliament, whereby a session ends with provision made for its next meeting. A second proclamation confirms or changes the date and may set the time for Parliament to meet for the 'Dispatch of Business' (the date can later be advanced or put back). A third proclamation is issued if the time for Parliament to meet was not announced in the second proclamation." You can also leave comments here by clicking the above button! What are you looking to hear from the government in today's Speech from the Throne in terms of priorities? Post your comments here or give Mark Sutcliffe a call: 1-877-296-2722! 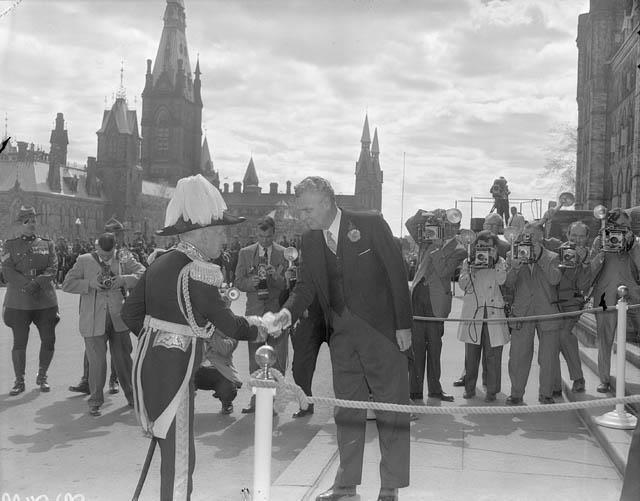 May 12, 1958: Prime Minister John Diefenbaker greets Governor General Vincent Massey. Diefenbaker and the Progressive Conservatives had just won the largest majority in Canadian history, to that point. The government writes the speech, which MPs debate for up to six days after returning to the Commons.The process begins with a motion by two government backbenchers to consider an Address in Reply: a short statement of thanks to the Governor General for providing the speech. Debate begins with “Leaders’ Day” and a speech by the leader of the opposition. By tradition the prime minister speaks next, followed by the other party leaders. Le gouvernement élabore le discours que les députés débattront durant six jours au maximum après leur retour à la Chambre. Le processus commence par une motion de deux députés d'arrière-ban du gouvernement en vue de prendre en considération une adresse en réponse au discours du Trône : un bref message de remerciement au gouverneur général. Les débats commencent par « le jour des chefs » et un discours du chef de l'opposition. Puis, selon la tradition, la parole revient au Premier ministre du Canada et, ensuite, aux autres chefs de parti. LIVE NOW: @_MarkSutcliffe taking viewer calls on-air. Tune in live and join the conversation! Call us now at 1-877-296-2722. LIVE NOW: @_MarkSutcliffe takes viewer calls on-air ahead of the Speech from the Throne. Join the conversation, call now at 1-877-296-2722! 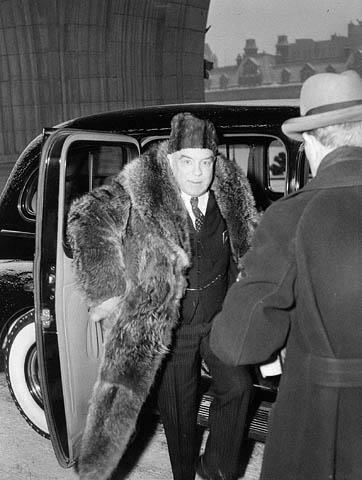 Prime Minister William Lyon Mackenzie King arrives on Parliament Hill for the throne speech: January 30, 1947. Chaque session parlementaire commence par une journée de grande pompe. Celle-ci comprend le discours du gouverneur général (ou bien du monarque si celui-ci est au Canada), qui dévoile la ligne d'action et les priorités du gouvernement et qui convoque les parlementaires à retourner à leurs activités. Looking for CPAC in your area? Enter your city at cpac.ca/en/cpac-in-you… to find your local channel placement! The royal representative almost always reads the Speech from the Throne. Sometimes the monarch performs the duty themselves. King George VI read the 1939 speech during a pre-war visit to Canada. Queen Elizabeth II did the same in 1957 and 1977. 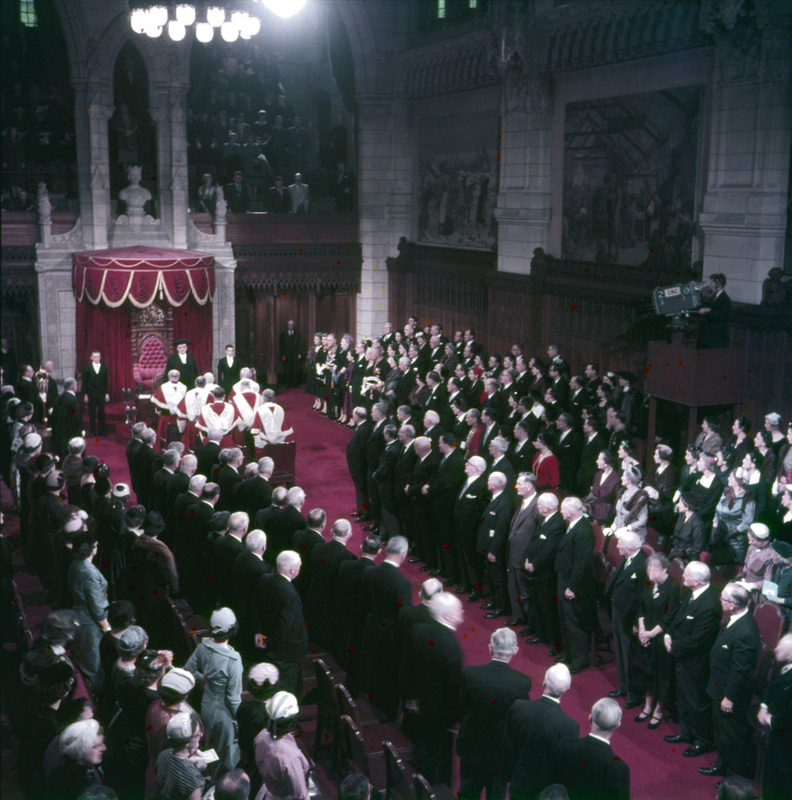 Whether a king, queen, or governor general delivers the speech, its text is entered onto parchment and presented to the Crown by the Speaker of the House. Il en revient presque toujours au représentant du monarque d'effectuer la lecture du discours du Trône. Il arrive parfois que le monarque effectue cette fonction lui-même. En 1939, le roi George VI a procédé à la lecture du discours au cours d'une visite royale d'avant-guerre au Canada. La reine Elizabeth II en fit de même en 1957 et en 1977. Que le discours soit prononcé par le roi, par la reine ou par le gouverneur général, une copie spéciale est imprimée sur papier parchemin et présentée à la Couronne par le Président de la Chambre. I heave greatly looked forward to being with you here in the Canadian Parliament in my Silver Jubilee year. Whenever I am in this wonderful country of Canada, with her vast resources and unlimited challenges, I feel thankful that Canadians have been so successful in establishing a vigorous democracy well suited to a proud and free people. 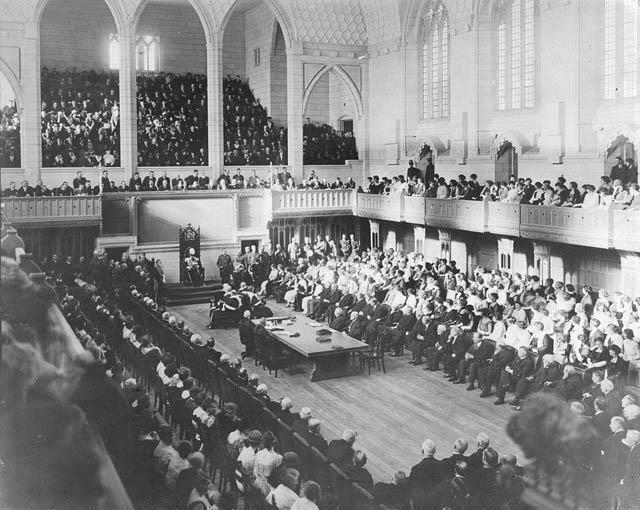 In this historic Chamber surrounded by the symbols and records of generations of Canadian legislators, I am very conscious of what Parliament has achieved – by transforming the visions and ideals of a great country into the enduring law of the land. In ten visits to Canada spread over a quarter of a century – seven in the last decade alone – Prince Philip and I have met many thousands of Canadians in all walks of life, of all ages, in every province and territory. My happiest memories of our travels throughout Canada have been these individual contacts which have revealed the enormous strength and astonishing diversity of this nation. A generation of Canadians has been born, and grown to maturity during my reign. I know you will understand when I say that I have a special interest in these young men and women, contemporaries of our own children. They are people made strong by the achievements of their parents and grandparents, but not imprisoned by the prejudices of the past. In their sensitivity towards other people, in their sense of justice, their generosity and good will, lie not only lessons for us all, but also the best and surest hope unity and understanding among Canadians everywhere. I look forward to meeting more of them next year in Edmonton when I shall have the pleasure of opening the Commonwealth Games. I have always been full of admiration for what Canada is: the new generation fill me with confidence for what Canada can become. The growth of these young men and women over the past quarter-century has been matched by a rapid expansion of Canada’s economic strength and international stature. Even in the midst of plenty, however, there are Canadians who know they are not receiving their fair share. To cite just one example, in those parts of the Atlantic Provinces where unemployment is particularly severe, some see themselves as an excluded group, able to gaze upon the good life only from a distance. There are many living in the West who have contributed much to Canada, yet believe their voice is little heard by others. There are many living in Quebec who feel deeply that Canada at present does not provide them with the opportunity to fulfill their reasonable aspirations. There are native peoples across the land who are still in search of a better life for themselves and their children. This discotnent in such a wealthy country must find its causes in the human spirit, and it is there also that the unity of the nation must be found. A greater willingness to listen to each othr, to understand each other's needs, a greater generosity between individuals and between different parts of the country, a greater willingness to sacrifice so that others may have a chance, to take less so that others may have enough – all these are in the realm of the spirit. All are essential to the unity of the country. Governments, of course, have a special responsibility to both encourage and respond to the spirit of unity by their words and their actions. Canadians are, I believe, coming to recognize the seriousness of the problem. They are recognizing the need to make a new and deeper dedication to mutual understanding and sharing. Given the new economic realities to which Canada must adjust, and the urgency of promoting linguistic and cultural harmony, it is readily apparent that Canada is now entering a new era. It can be an era of increasing confrontation, tension and division, or an era of enhanced freedom, co-operation and unity of purpose. Fundamentally, the choice must be made by every citizen every day. It is apparent to thoughtful Canadians everywhere that this is a time of great decisions for Canada, a time for re-discovering the strength and potential of a marvellously free and caring society. That re-discovery will require that Canadians rededicate themselves to each other’s well-being, just as I dedicate myself anew today to the people and the nation I am very proud to serve. You will be asked to consider budget proposals and to approve the expenditure of funds required for the administration of government services and programs. May God bless and inspire all your deliberations and decisions. Her Majesty the Queen was pleased to retire. Peter Van Dusen is previewing the speech with MPs Bill Casey (Liberal), Michelle Rempel (Conservative), and Peter Julian (NDP). En 1984, le quotidien Montreal Gazette a déclaré que l'événement avaient pu mystifier les Canadiens qui l'écoutaient à la télévision. En fait, cette tradition britannique remonte au 16e siècle. L'huissier du bâton noir et le Président de la Chambre escortent les membres du Parlement à la salle du Sénat pour le discours étant donné que les sénateurs et le gouverneur général ne peuvent pénétrer dans la Chambre des communes. Entre-temps, le gouverneur général est à la tête d'un cortège qui se rend à la colline du parlement depuis le Rideau Hall. Une tradition est propre au palais de Westminster. Les caves y sont inspectées avant chaque cérémonie d’ouverture du Parlement en signe de reconnaissance de l’échec de la Conspiration des poudres de 1605. Celle-ci aurait pu provoquer l’explosion de la Chambre des lords et la mort du roi Jacques Ier signalant ainsi le début de la révolte des catholiques en Angleterre. Will be up on @CPAC_TV shortly to talk Speech From the Throne. The Governor General will inspect the 100-member Guard of Honour in front of Centre Block, with a 21-gun salute fired every 10 seconds. Governor General David Johnston is scheduled to enter the Senate chamber with Prime Minister Justin Trudeau at 3pm ET. The audience includes senior diplomats, Supreme Court justices, the RCMP commissioner, and chief of the defence staff. 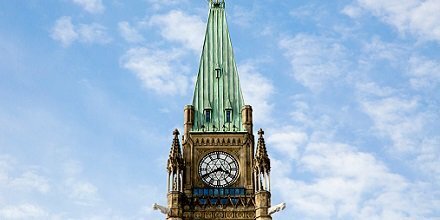 Bells will summons senators to the upper chamber at 2:15pm ET before a brief suspension as the speaker awaits the governor general. Restez à l’antenne de CPAC après le discours du Trône pour profiter de la couverture en direct depuis le foyer de la Chambre des communes. As always we're looking for your reaction to today's speech. What are hoping to hear? Send us your reaction here as the afternoon unfolds! 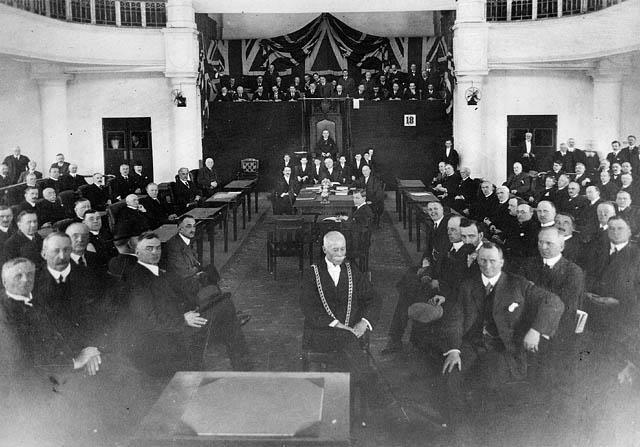 Here's how the scene looked on March 18, 1918 -- the first session of Parliament following the Unionist victory the previous year. 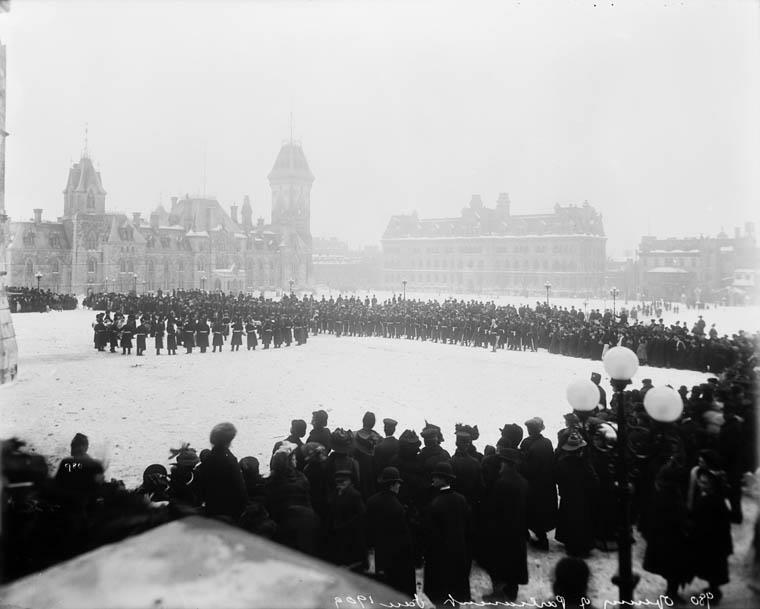 Parliament was sitting at the Victoria Memorial Museum Building -- current home of the Canadian Museum of Nature -- following the 1916 fire that virtually destroyed the Parliament Buildings. 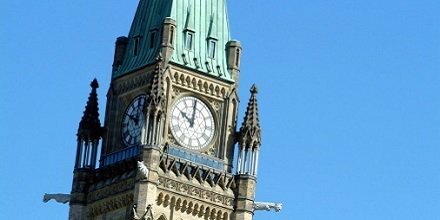 Prime Minister Justin Trudeau will introduce Bill C-1, the traditional pro forma legislation put forward at the start of each Parliament that affirms the government's ability to address issues not contained in the Throne Speech. The speaker will also announcement membership for the Board of Internal Economy and the appointment of deputy speaker and two assistant deputy speakers. Government House Leader Dominic LeBlanc will move the appointment of members to the Standing Committee on Procedure and House Affairs, which is charged with creating membership for other standing committees. House of Commons now paying tribute to retiring clerk Audrey O'Brien. Board of Internal Economy is named: Dominic LeBlanc, Judy Foote, Andrew Leslie, Andrew Scheer, Gord Brown, Peter Julian. Conservative MP Bruce Stanton named deputy speaker. The Address in Reply to the Speech from the Throne is typically moved by a rookie MP from the government backbench. This concludes our online coverage of the 2015 Speech from the Throne. Stay tuned to CPAC-TV for more reaction. Thanks for watching!